The white, yellow and gray colorings of this Beluga Whale are very easy to see in this picture as he surfaces in the cold waters off of Churchill, Manitoba. This Beluga Whale watches us with one eye but gives us a close look of his colorings such as the gray patches around his head which are beginning to fade. These remaining shades will eventually turn white as well like the remainder of his body. When a Beluga Whale is born, the coloring of his body is a dark gray and slowly begins to fade as they age. 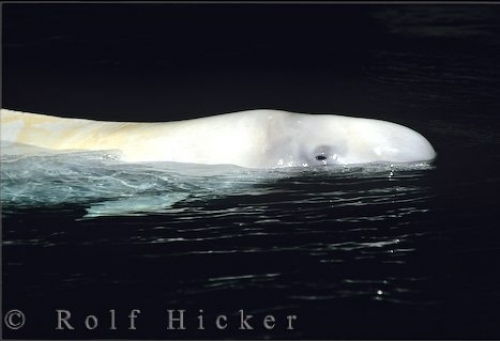 As this Beluga rests on the surface of the chilly Manitoba waters, it gives us plenty of time to snap a picture or two. On the top of the melon shaped head of the Beluga Whale, you will find its blowhole which can produce a variety of different noises. This aids in the Beluga Whale being able to communicate with other members of the same species. The Beluga Whale is a smaller species of whale and has no fins except for its rounded flippers on the underside of its body and its tail fluke. As it resides in colder waters, having no dorsal fin makes it easy for the Beluga Whale to swim under the large ice masses. A Beluga can grow to be about fifteen feet long and weighs in at approximately 3,300 pounds with the males being a slight bit larger than the female species. They are definitely the cuter type of whales as their facial features make the Beluga appear as if it is smiling. Even though a Beluga Whale is smaller than most, it's swimming speed is fairly slow at about two to six miles per hour. They can pick up speed for short periods of time and reach speeds of up to fourteen miles per hour but that usually will not last any longer than about fifteen minutes. The Beluga Whale likes to spend a majority of its time in waters that are shallower as this is where they find terrific feeding grounds. While traveling on the cold Arctic waters, look along the inlets, channels and bays to see if any blows from a Beluga Whale are present.